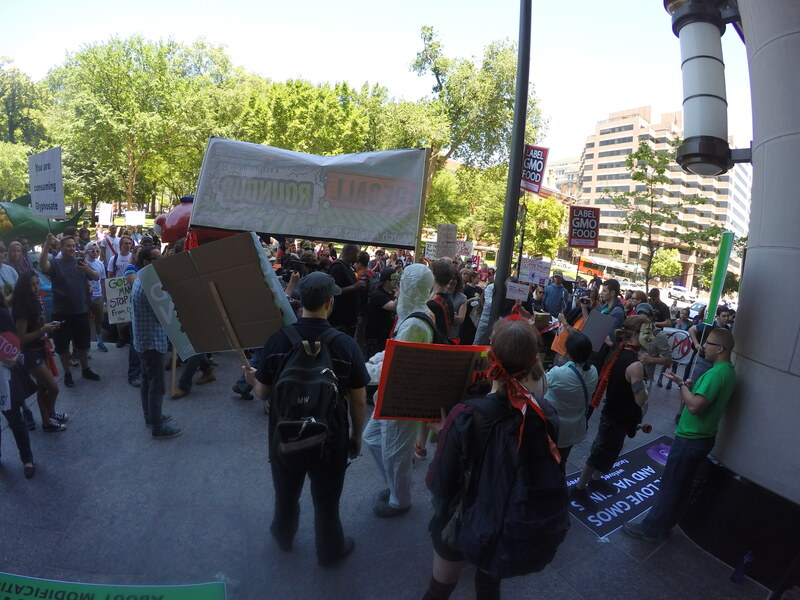 The March Against Monsanto happened this weekend. It’s been happening for a few years now, but this year was a little different. There were a few souls that chose to stand up to these bullies by staging a counter protest. MAMyths, or March Against Myths About Modification, is the brainchild of Karl Haro von Mogel, Kavin Senapathy, and David Sutherland. They put out the call for everyone to stand up for science, and my family, along with others, answered. 1) While I’m sure my kids have heard the word “f**k” before, I’m quite certain it’s never been yelled in their faces. 2) It’s never fun to have ‘Caution Monsanto BioHazard’ tape wrapped around you and 10 of your new best friends by people shouting rude things with a bullhorn. Lesson #1: In the end, I’m still glad we attended because it became very obvious on which side of this GMO caution tape we should be standing. I’d much rather be on the side with 10 people of integrity than feel the safety of numbers with 200 individuals yelling obscenities. 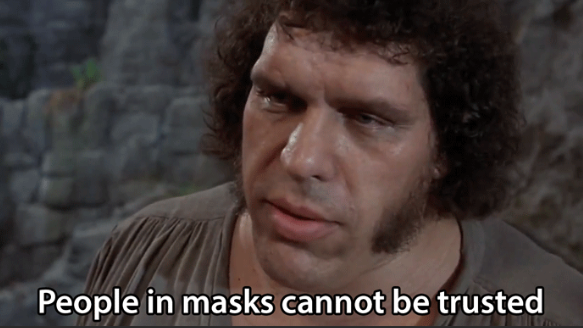 Lesson #2: If your side needs to wear a mask in order to say what you want to say, there is something very wrong. History is full of examples of men hiding behind masks, and they’re usually cowardly little people without their coverings. Yes Mr. Masked Man, you have freedom of speech. It’s Memorial Day weekend and there is a large cemetery exactly 2.7 miles away that holds the bodies of the men and women that died for your right to stand there and swear at me. You apparently also have freedom from civility, but that only shows the character of you and your cause. My children desperately wanted to attend this event, even after we warned them that it was likely to be rather unpleasant. I know they didn’t enjoy being yelled at, or asked how much Monsanto payed them (really?! ), or told they were going to die from eating GMOs. Yet, afterwards, they said they were glad to have been there, despite the lovely couple in the video above, because it gave them a better sense of why our family is so involved in this issue. There are close to a million children going blind or dying from Vitamin A deficiency every year. Biotech has an answer for that. There are people unable to grow high yielding crops in the arid parts of Africa. Farmers were burning up fuel, time, and money applying considerable amounts of pesticides. Biotech developed an answer for that. Papayas were about to be wiped out in Hawaii. Biotech found an answer for that. Hey Hey! Ho Ho! Stop your myths on GMO! -thanks to David Sutherland for the chants today. Tags: Angry Elf, biotech, David Sutherland, Karl Haro von Mogel, Kavin Senapathy, MAMyths, March Against Monsanto, March Against Myths About Modification, Monsanto, Myths About Modification, People in masks cannot be trusted. Bookmark the permalink. Awesome read! So sorry you had to deal with verbally abusive people. I helped organize the MAMyths in Portland, OR, and although the anti-GMO sentiment is strong here, people were surprisingly civil. I guess Portland has that reputation of friendliness. Thank you for taking a stand against these bullies! Thanks Sarah! I’m very appreciative of all the effort that went into each and every event, so thanks to you as well. The Victoria BC MAMyths event was peaceful. It was great talking with people who just wanted to know what GE crops were all about. I’m glad you went, and glad for your kids, despite the unpleasant encounters. You know, I don’t remember everything my parents told me–but I do remember very clearly what my parents did to stand up for what was right in our community. I remember where they put their time and their efforts. And that continues to drive me today as well. Not only that, they wanted to know if I was paying them to be there. As if. They are out of touch with reality. I would not be surprised at anything they said. I agree with Stephanie. Thomas Friedman (New York Times columnist and author) concluded that those protesting at these anti events (Occupy, MAM, etc) are looking for their ‘1960s’ fix, a chance to protest against ‘The Man,’ and are a Noah’s ark of anti-corporate, anti-capitalism, anti-globalization and anti-free trade folks. Consideration and appreciation of what biotechnology can contribute to a better world is not in the cards for them. A bit unpleasant I’m sure, but you and the family are doing the right thing and can be proud. Many times it is small groups of courageous people standing up for what may not be popular, but that is right, that lead to permanent change. One should never be swayed by numbers and should never be discouraged by apparent short term defeats. If a cause is just, it will usually prevail in time. Hysterical propaganda and personal agendas will eventually give way to sound science. When causes can’t hold up to scrutiny people resort to intimidation, disrespect and bullying to enforce their will. They’re not wearing masks to hide their identity, it’s the symbol of the hacker collective “Anonymous” taken from the movie V for Vendetta. It’s still to hide their identities. That’s what Anonymous is about. Well done you and the family! Masked scumbuckets! It’s just so telling of this movement when people think it that it is okay to act like this. I’m irked that the industry behind it never acknowledges this tactic. When people with very little knowledge are manipulated like this, the results are not pretty. Keep standing up for the facts! You know there are many supporters out there behind you! Just MARK it clearly ,which product contains GMO and which is NOT containing GMO and let the consumer decide. Isn’t it nice that we can already know what is and isn’t GMO? Organic foods are clearly labeled and all are GMO free. How can something contain a farming technique or breeding method? GMO is not an ingredient. It isn’t IN any food. Hats off to your family! Am in Japan where farm products are provided w respect …what a refreshing feeling… No labeling of non whatever but what you see on some labels are photos of the farmers. Even at the farm to table restaurant in Mitsukoshi propaganda material favoring a type of food or growing method was not seen. Very interesting Mae. Are food prices higher there than in Hawaii?